The Internet Corporation for Assigned Names and Numbers (ICANN) has given dotAfrica the ahead to proceed with their launch plan after the domain was put in the root zone. According to ZACR NPC, the dotAfrica Sunrise Period will run for the next sixty days beginning today, 4 April 2017 – 2 June 2017. While the launch begins, the domain dispute is still going on in a California court. The case matured from an IRP which took 2 years and DotConnectAfrica won, it was the first ever IRP in the new gTLD program to be won by an applicant. The case is now set for trial in February, 2018. Following that, on March 4th 2016 DCA won its first ruling that granted an Ex Parte Application for TRO (DE ) Interim Relief that ICANN should hold off from delegating the .AFRICA generic top-level domain (gTLD) for ZA Central Registry (ZACR) and on April 12, 2016, the Court in Central District Of California granted DCA Trust a Preliminary Injunction on the .Africa gTLD, the decision was made for case no. 16-CV-00862 RGK (JCx) [PDF]. 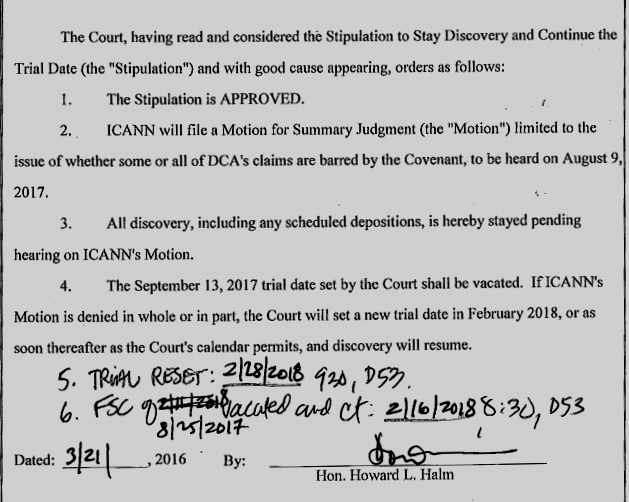 ICANN went on to appeal and the judge made decision to deny DotConnectAfrica’s Motion for Preliminary Injunction to stop the delegation of the .AFRICA generic top-level domain (gTLD) to ZA Central Registry (ZACR), after DCA’s case was remanded from Federal court due to lack of jurisdiction. The judge made the ruling, however it does not yet address or resolve the merits of the claims made by the plaintiff DotConnectAfrica but merely states that DCA is unlikely to win its suit due to the covenant it signed. It is evident that the case at the Court is still in early stages, and there are more decision to be made by the court.